Toys for Tots Donations, visit from Santa Claus highlight holiday activities this winter. SOUTH WILLIAMSPORT, Pa. (November 15, 2018) – Each year, the holidays provide family and friends with a variety of exciting events and opportunities, and this holiday season, visitors from all over can enjoy themselves at the World of Little League® Museum and Official Store. Over the course of the next month, Santa Claus will be making a visit, new toys are being collected for the Marine Corps Reserve Toys for Tots program, and unique gifts will be available to satisfy all your holiday shopping needs. On Sunday, December 9, Santa Claus will be taking some time out of his busy schedule to visit the Museum from noon to 3 p.m. Additionally, an operating train will be set up by James Stabley. All visitors will receive free admission to the Museum during Santa’s visit. Along with free admission, visitors to the museum will have the opportunity to take photographs with the Jolly Old Elf at no charge, tour the museum, and receive a 30 percent discount on the purchase of one item in the Museum Store on that day. For the 13th straight year, the World of Little League Museum also will be participating in the Marine Corps Reserve Toys for Tots Program this holiday season. Each visitor who brings a new, unwrapped toy with a value of at least $10 to the Museum between now and December 14, will receive one free Museum admission for later use as a thank you for supporting the local Toys for Tots program. Additionally, there will be in-store specials and holiday gift-giving ideas. Toys collected at the Museum will be given to the American Rescue Workers and the Salvation Army for local distribution in Williamsport, South Williamsport, Loyalsock Township, Cogan Station, Trout Run, and Linden. In addition to the toys donated at the World of Little League, children in Greater Lycoming County benefit from Toys for Tots donations at area collection centers. Donations collected in Jersey Shore will be distributed through the Grace Lutheran Church; donations from Hughesville, Montoursville, Muncy, and Picture Rocks will be distributed by the Veterans of Vietnam War Post 51. The Montgomery Christmas Committee will distribute toys to Montgomery area children. Checks and money orders made payable to Toys for Tots should be sent to Bill Dougherty, 500 Quail Lane Cogan Station, Pa., 17728. Those will then be sent to the headquarters of Toys for Tots in Quantico, Va. The funds will then be placed into Mr. Dougherty account so he can buy toys for age groups that the five distribution sites are short of for the Holidays. Local Toys for Tots campaigns are conducted in 825 Communities. 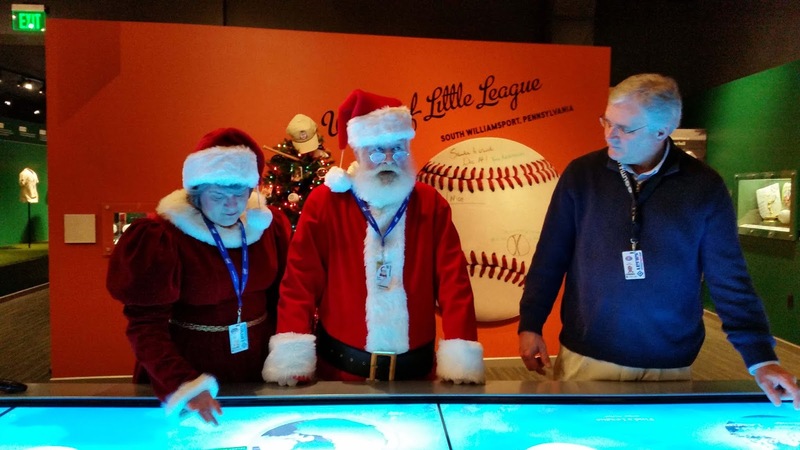 Additionally, during the month of December, the World of Little League Museum is joining with businesses across the Susquehanna River Valley in the Holiday Shop Local campaign in coordination with the Susquehanna River Valley Visitors Bureau and Endless Mountains Visitors Bureau. As part of the campaign, which begins Black Friday (November 23) and ends the last week in December, the Museum is offering 10 percent off a purchase of $30 or more. There will be 20,000 shopping passes available for distribution at more than 100 locations throughout the valley and Pennsylvania Welcome Centers. Shopping passes will be available beginning Monday, November 20, throughout participating venues in the Susquehanna River Valley. Along with the Holiday Shop Local campaign, the Little League Gift Shop and Official Store will have a variety of sales opportunities throughout the course of the holiday season. The holiday savings will kick off on Black Friday, November 23, with exciting sale opportunities at both the Museum Official Store and the Little League Gift shop and will continue on Cyber Monday, November 26, with exclusive sales on LittleLeagueStore.net. On November 29, the Little League Gift Shop will be hosting its first ever Friends and Family sale with exclusive major markdowns on almost all merchandise as well as the chance to get a FREE pin. Throughout the upcoming holiday season, the museum will be open from 9 a.m. to 5 p.m. daily, except for Thanksgiving Day (November 23) and December 24, 25, 31, and January 1, when it will be closed. Please contact the museum (570-326-3607) or check its digital sign or Facebook page at Facebook.com/LittleLeagueMuseum for updates on store specials, weather alerts, and more. The World of Little League®: Peter J. McGovern Museum and Official Store, located at 525 Montgomery Pike (U.S. Route 15), is open daily from 9 a.m. until 5 p.m. General admission is $5, children (ages 5 through 12) are $2, and senior citizens (ages 62 and older) are $3. Children four years and younger are admitted free of charge, as well as any Little Leaguer wearing a uniform shirt that includes the Little League official shoulder patch. Additional information about the museum, events and its inclement weather schedule can be found at LittleLeagueMuseum.org or by contacting the Museum at 570-326-3607. Follow World of Little League on Facebook (facebook.com/LittleLeagueMuseum) and Twitter (twitter.com/LLBMuseum). Visitors of Lycoming County are also encouraged to visit the Lycoming County Visitors Bureau website, www.vacationpa.com, or call toll-free, 1-800-358-9900.